Wheelersburg quarterback Trent Salyers was named first team All-Ohio at the quarterback position for the second consectutive season. Portsmouth junior running back Talyn Parker was named first team All-Ohio following his stellar junior season for the Trojans. On Monday, the Ohio Prep Sportswriters Association released their first, second, third, and honorable mention All-Ohio teams for Divisions IV, V, VI and VII. Scioto County was once again well represented among those selected for the All-Ohio teams. 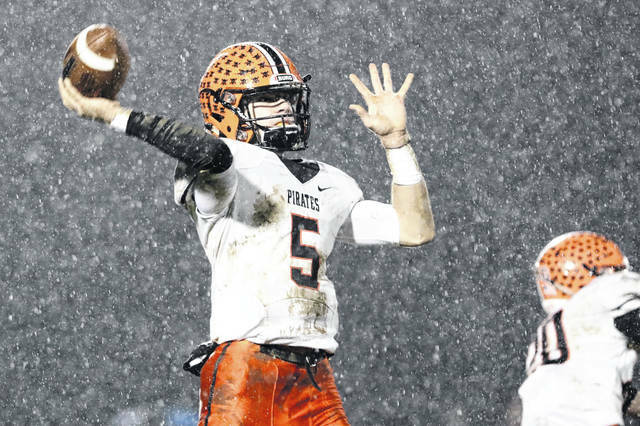 The Division V state semifinalists, the Wheelersburg Pirates, were maybe the most well represented among those honored in the All-Ohio lists. Pirates senior quarterback Trent Salyers was named to the first team all-offense at the quarterback position by amassing 1910 yards on 103 completions on just 165 attempts. Salyers threw for 26 touchdowns and only four interceptions, as well as ran for 234 yards and four rushing touchdowns. Wheelersburg junior receiver Makya Matthews was also named to the All-Ohio first team offense by grabbing 29 catches for 674 yards and nine receiving touchdowns. Matthews is undoubtedly a favorite to find himself on the All-Ohio first team again next season following the graduation of a large number of his teammates this spring. Senior linebacker for Wheelersburg, Evan Dahm, was the only Pirate named to the All-Ohio first team defense after he had a team high 63 combined tackles, as well as a team high 46 solo tackles. Pirates seniors Tanner Holden and Baylen Haywood were named to the All-Ohio second team offense at the receiver and lineman positions respectively. Jalen Miller, Chase Stidham, and Evan Horsley were all named to the All-Ohio honorable mentions list. Portsmouth junior running back and Southeast district player of the year, Talyn Parker, was the lone Trojan to make the All-Ohio first team after his stellar junior campaign in which he ran for 2470 yards on 254 carries and 29 touchdowns in the regular season. Parker has garnered interest from a number of Division I universities and is, along with Matthews, a favorite to find a spot on the All-Ohio first team again next season. Portsmouth senior linemen Colin Boehm and Brian Carey Knipp were both named to the All-Ohio honorable mentions list after their anchoring of the offensive line in front of Parker and also leading the Trojans to their first playoff appearance since 2007 under first year head coach Bruce Kalb. Portsmouth West running back Garrett Hurd and playmaker Josh Berry were both named to the All-Ohio honorable mentions list after their great senior season in which the Senators made the playoffs as the eight seed in the Division V Region 20 rankings. Hurd finished his senior season just shy of a thousand rushing yards at 976 with 11 rushing touchdowns, while Berry had 690 all-purpose yards and a total of eight touchdowns. The Minford Falcons two representatives on the All-Ohio team include linebacker Luke Lindamood and Matthew Risner. Lindamood had an outstanding senior year from his linebacking position by totaling 112 total tackles, 7 tackles for loss, 1 forced fumble and 1 fumble recovery. Risner had a great year on both sides of the ball. On the offensive side, he caught 5 receiving touchdowns as well as 449 receiving yards, while also rushing for 90 yards and 1 rushing touchdown. From his defensive back position, Risner had a total of 64 tackles, 3 interceptions, one of which was returned for a touchdown, and 5 pass break ups. Scioto County’s lone Division VI team, the Valley Indians, had two players named to the All-Ohio honorable mentions list: senior quarterback Andrew Shope and senior running back Gabe Streeter. Shope had a great statistical year for the Indians by completing 70 out of his 122 pass attempts for 1075 total passing yards and 15 passing touchdowns, as well as on the ground with 47 carries for 360 yards and four rushing touchdowns. Streeter’s quickness allowed him to rush for 928 yards on 117 carries for ten rushing touchdown’s during his senior campaign. The Green Bobcats, who finished their season 8-3, the school’s best record since 1990, had three players named to the All-Ohio list: running back Alec Smith, and defenders Lonnie Smith and Caleb Derifield. 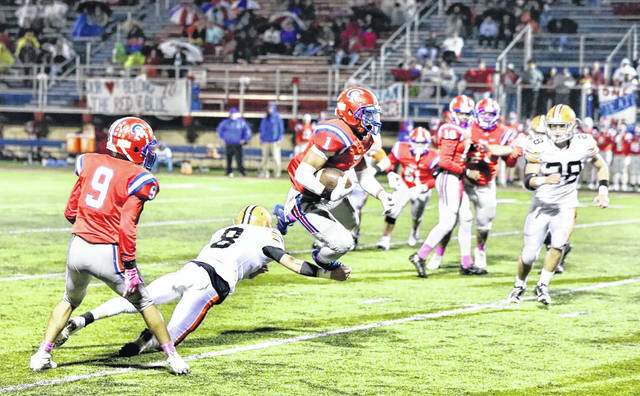 Smith rushed for 1024 yards and 14 rushing touchdowns in his junior season, good enough for third team All-Ohio. Lonnie Smith, who was also named SOC I defensive player of the year, led the Bobcats with a team high 81 tackles, 10 sacks, and 18 tackles for loss and was named as an honorable mention in the All-Ohio honors. Derifield was also named to the All-Ohio honorable mentions list by amassing 78 tackles, 4 sacks, 9 tackles for loss, 2 forced fumbles, and 1 defensive touchdown.